Not quite the Phantom of the Opera, but nevertheless psychologically seducing the ingénue was my game last weekend. 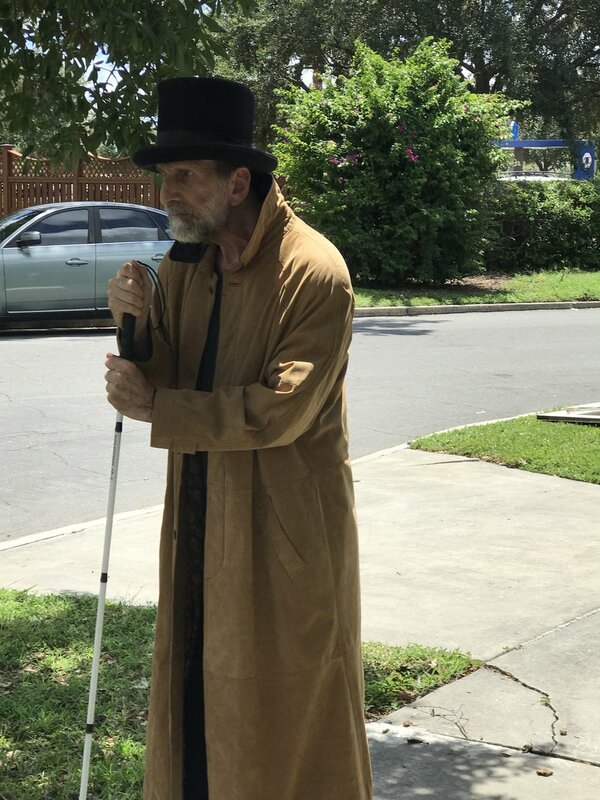 When a blind actor is offered the role of a menacing villain in a short horror film, he signs on. Though the “girl” subscribes to the paranormal and reads tarot cards, she is innocent and wholesome until falling under the spell of the bad guy. The “boy” hasn’t a chance against this formidable foe. As she slowly becomes unhinged and angles to dispatch her fiancée with a large blade, the creepy blind man blissfully witnesses the event. With a vintage top hat, long leather coat, Doc Martens boots and some nifty scar makeup, my character didn’t have to say much to get his point across. The film was framed so the viewer will be able to see what I am thinking, and my actions will be enough to psychologically manipulate the girl to attack her soon-to-be husband. Ah! The magic of movie-making! It does take a special sort of producer and director to hire an actor with a disability, even when the actor is otherwise right for the role. It's a production team with imagination who can see that hiring a performer with a disability can add an extra layer to the character, making him or her that much more interesting. On the set, it all boils down to director and actor collaborating and adapting so the script can be served and the actor accommodated. Being on a film set is actually a nice environment for a blind actor. Once in position, you usually don’t have to move very much and, as opposed to acting on the stage, you generally keep your expressions and gestures small. You always have the benefit of a rehearsal and if the scene doesn’t go well, you just shoot it again. Before each sequence, I ask to “walk” the set to get a sense of the space I’m working in. Then I ask the director how I’m to be framed – full on, from the waist up, chest up, or just the face. I'll also ask the DP (director of photography) to clap his hands in front of the lens so I can locate it. After that simple prep, not unlike any non-disabled actor, it’s just a matter of disappearing into your character, listening and reacting to the other characters, and delivering your lines honestly. Of course, there is the occasional outtake that catches you in a more playful moment. Like any competent actor, I strive for a well-drawn and nuanced performance while trying not to blink and keeping my mouth closed when I’m not speaking.